BOISE, Idaho — A Boise real estate agent is making sure that people who are doing good things are getting noticed here in the Treasure Valley. Jeff Wills started a community appreciation campaign called #ISeeYou, and it's bringing a lot of joy to the people he honors. “Sometimes it needs to be said, 'Hey, I see you, I appreciate you, and please don't stop what you're doing because it makes a world of difference to everybody,'" Wills said. He started the campaign this year to say thank you to people who are doing the right thing and may not get recognized for it. He and his team at Amherst Madison Real Estate are always looking for people who qualify. "I just wanted to make sure that the people I come across in my life who are doing the right things for the right reasons, got highlighted," Wills said. KTVB tagged along with Wills while he honored Katie Little. She works at the West Boise YMCA at the front desk, greeting members with a smile. Jeff says she knows everyone by name and says she cares about all the members, and it shows. “Katie has the ability to make everyone's morning," he said. Little was pleasantly surprised when Jeff approached her with an appreciation card with the words #ISeeYou on it. She couldn’t believe it. “I'm shocked, I really am, to be recognized is really an honor," Little said. Wills says he always snaps pictures of the good citizens he honors, and then posts those photos on Facebook, with the hashtag #ISeeYou. He's honored close to 20 people so far. Jeff Wills of Boise hands out these #ISeeYou appreciation cards to people he thinks are doing the right thing. He gave one to Katie Little. 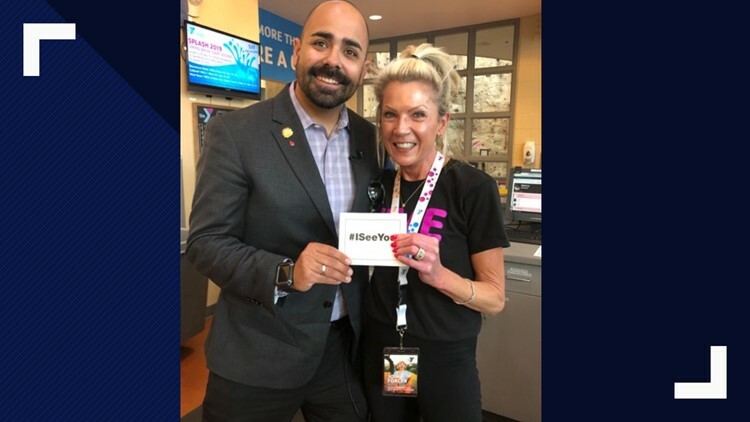 She works at the West YMCA, and Jeff says she makes everyone's day. “They are usually shocked, sometimes they are like, 'Do I need to do something?' I'm like, 'No, you already did the thing,'" he said. "I just want to let you know that I've seen it. Usually, it kind of catches them off guard typically, but they enjoy it." Wills says he plans to keep this #ISeeYou campaign going all over the Treasure Valley, to inspire others. Check out the hashtag #ISeeYou on Facebook to see more of Jeff's honorees.